Which of the following should you do next? a) Clear your schedule and open your PowerPoint converter software. b) Ask the client some questions. Uncover the client’s business goal — discover how the project will measurably change the organization’s performance. 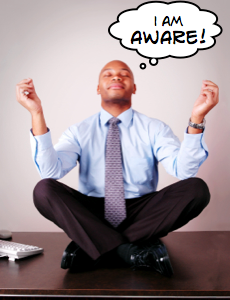 Identify what people need to do on the job with their “awareness” and why they aren’t doing it. The answers to these questions will help you design realistic, challenging activities that help learners apply the policy and improve the organization’s performance. How do you know that people aren’t already aware of the policy? How is that lack of awareness affecting the performance or earnings of the organization? How will that measure improve when everyone is aware of the policy? Ideally, you and the client will identify a specific change, such as, “Reduce information leaks 30% by 2014.” “Know” or “understand” don’t fit here; we’re looking for observable results. By identifying a measurable change, you aren’t claiming that your course will single-handedly achieve this change. You’re saying that your materials will be designed to contribute in an observable way to the change, which very likely will have non-training components as well. And, importantly, you’re breaking your client’s likely obsession with information and making them think instead about results. Once you’ve gotten the client to identify a measurable goal, help them identify what people need to do to reach it. Enlist the help of a subject matter expert who’s familiar with how people are currently doing their jobs. What are people doing wrong now, or failing to do? What are the most egregious mistakes? What do people need to do instead of what they’re doing now? When you ask, “What do people need to do?” often the client will say, “They just need to follow the policy!” But to write meaningful activities, you need more specific job tasks, such as, “They need to encrypt every email that contains a client’s name and account number.” Help the client or SME get this specific and prioritize the tasks to identify the most common and serious mistakes. While you’re talking about specific tasks, it’s a good idea to ask why people aren’t doing that task or why they’re doing it wrong. Is the problem really a lack of awareness? You can ask your client or SME to consider how the four aspects shown in this matrix affect people’s performance of the task. For example, if people aren’t encrypting documents that they should encrypt, is it because they aren’t aware of the rule? This would put the problem in the “knowledge” quadrant. Or are they skipping encryption because the process is cumbersome and often results in a bizarre error message, so people in a hurry decide it isn’t important enough? This would make environment and motivation more important and could inspire improvements to the encryption software. Few performance problems are caused purely by lack of knowledge or skills. 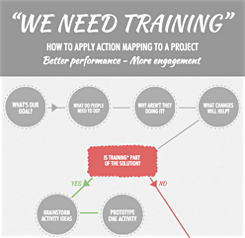 Training is rarely a complete solution. A more complete solution often includes process or software improvements, clearer direction from managers, more fulfilling rewards for good performance, or something as simple as a job aid for information that doesn’t need to be memorized. By taking a couple of hours to ask these questions, you’ve gotten the information you need to design contextual, challenging activities that help learners practice applying what they’re supposed to be “aware” of. Now, instead of presenting the policy in a bunch of information screens, you’ll be able to “test, then tell”: you can first challenge the learners with a realistic decision like those they make on the job, and then use the consequences to reveal the necessary information. You’ve also encouraged the client to focus on observable results, and you’ve gotten them thinking in terms of actions, not information. As a result, they’ll be less likely to insist on an information dump. Your client will be eager to see (and needs to see!) quick prototypes of the activities so they understand how unlike a presentation your materials will be. 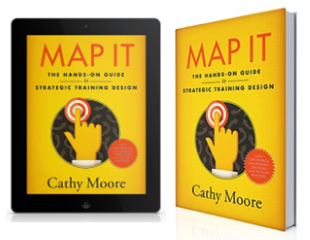 We’ve just covered the first two steps of action mapping, my streamlined, visual approach to instructional design. I’ve reorganized the blog to make sure it all relates to the instructional design approach that I teach through my workshops. Check out my visual organizer to see the topics covered in the blog and my seminars. This post also appears in the Allen Interactions blog, where you’ll find lots of great design ideas and inspiration. I get requests for “awarness” training from our internal clients who say their primary goals is to eliminate “I didn’t know this” as an excuse for doing something wrong. Or said differently, “We just want to make sure our staff were ‘exposed’ to the information.” Its almost as if they want to implement training as a contract. Its frustrating, but this blog helps. Thank you. Ahh a new post. I’ve been counting the days, checking daily for a new thought. This is like a breathe of fresh air. I’ve been through nearly every page, post, and presentation about a dozen times waiting. The bonus is that this covers something I hear and deal with constantly. As always we’re on the same page, most times I am able to convince the client (all internal clients) that this is the direction we need to move. This is normally where I’m the lead or the Project Manager. My question/challenge is when I’m brought in to “help” with a project that is moving forward in the wrong direction. The client/sme has been “asked” questions multiple times (not by me) and thought they gave all that was needed. Now I come in with questions that are seemingly “challenging” what the solution is and these questions are more thought provoking. How to I convince them that we need to put the brakes on and get a clear picture on what really NEEDS to be done? Ron, thanks for your kind words and your question. It can be really hard to change the direction of a project that’s rolling fast down the slope to an information dump. One trick that might help is to show the stakeholders a prototype of a mini-scenario-type activity that simulates the decisions that people have to make on the job (or show them another project that has that type of activity). With any luck, they’ll see the superiority of a contextual, challenging activity. They’ll realize that they need to get way more detailed in order to create such an activity, which will (ideally!) make them more open to the necessity of looking more closely at what really needs to happen in the business and the course. Also, if you can somehow use the work that’s already been done (maybe it would make a decent job aid or online reference), then people might be open to doing more work in a better direction. Hi Cathy and thanks, Paul, for the question. A similar situation here except I’m building face to face training packs for a team of trainers, doggedly steering them away from meaningless info dumps into more challenging activities. Thanks, Cathy. We’ve missed you!!! I never tire of reading about needs analysis strategies and how to probe with key questions, probably because the mindset we’re needing to shift is so deeply ingrained in clients, and often ourselves. This couldn’t be a more timely return. I just received a course directive where they ask for “awareness” from the audience. Luckily, I did the first step and got the business goal down, which the SMEs were surprised to discover was not as easy as it sounds. Thank you! Thanks, everyone, for your responses! It’s good to be back. I liked this one. I spend a lot of time explaining that ‘understand’ is not a very measurable learning objective, and goals like ‘awareness’ are somewhat vague. Another good one to get some tips about at some point would be the target audience ‘everyone.’ The answer I often get when I ask ‘so who is this awareness training for?’ Everyone! ‘Really? Directors, accountants, receptionists, designers, drivers, managers, everyone?’ Yes, everyone … 🙂 We have a fun job don’t we!?! This is the first time I visit your blog and this is the first post I have just read. I just wanna say : THANK YOU for such a great and practical post. I can feel that it comes from your experience. My ambition is to become an Instructional Designer one day. My partners and I are trying to change our training courses into dynamic offerings! As much as I understand Action Mapping (haven’t taken a course yet), it seems like a terrific option for us. We offer on-line education to individuals who need specific training for certification for their jobs. My challenge is to get our courses approved by each individual state, thereby becoming a state-approved provider of education/training. Intellectually, I know this is the way to really “educate & integrate” critical and essential information to individuals, but I hope I can “get it” enough to revise our courses! Any thoughts? Jan, thanks for your comment. 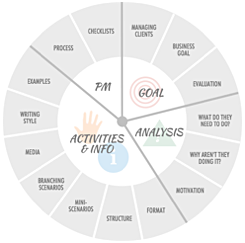 Usually action mapping produces courses that feel like a series of activities rather than a presentation of information, and the activities are usually scenarios or simulations of realistic situations. Unfortunately, accreditation boards usually expect to see information presentation and fact-checking “assessments” that test mostly rote memorization, not application. So if you design a more action-mappy course, you might want to make sure that the scenario-style activities will stand up to criticisms like, “But does that activity prove that the learner knows X?” A well-designed activity will not only prove that the learner knows X, but also that they can apply it in a realistic situation. So you might need to do a little educating when you approach the certification folks, or you might need to have a fact-checky “assessment” after the more engaging and effective scenarios, just to satisfy the accreditors. Good luck! Hi, Cathy. I am just entering the ID field after earning a degree last year. I’m having a difficult time switching gears, because I’ve been in the K-12 setting for 13 years and it’s hard to now think in terms of adult learners. Your blog has really been both a huge help and inspiration to me – I read it almost daily. My question – I feel pretty comfortable with the analysis and design phases, but since I don’t have much experience in the development area, I often shy away from opportunities outside of school. I know that you don’t advocate for any one software program, but could you give me an idea of a project that I could do on my own to wet my feet in the development department? I follow Kuhlmann’s blog as well and have played around with some simple branching in PPT. I guess I just need some encouraging words to push me out of my comfort zone, and help me “cross over” from K12 to adult learning. Another great blog post as always Cathy. 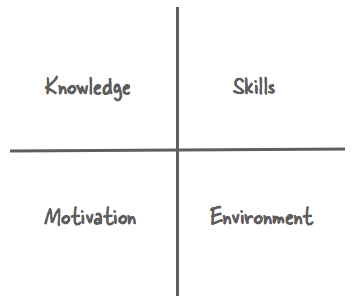 I especially like your Knowledge-Skill-Motivation-Environment quadrant and your comment about how RARE it is that the cause of a problem is actually a lack of knowledge and skills. I agree completely! Thanks for the awesome read. 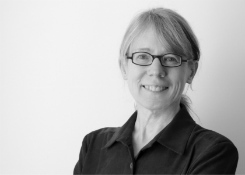 As always Cathy, when I get that inner rumble that something is not right with my design, I turn to your blog and find exactly what I’m looking for. I just received an email from a client who is only going for awareness in their eLearning, and I thought, “What the heck does that mean?” Sure enough, you perfectly defined it here and I’ll be asking these questions at our weekly meeting. Feedback in scenarios: Let them think! Scenarios: What are they good for?